The fine folks at Patell and Waterman's History of New York, Cyrus R. K. Patell and Bryan Waterman, are the editors of The Cambridge Companion to the Literature of New York, out now. The book covers a wide swath from Wharton, Melville, Whitman and the rest of the usual suspects, to topics such as African-American literary movements, staging gay and lesbian New York, and a look at the East Village's poetry and punk traditions. The editors and contributors make this an illuminating, essential read. 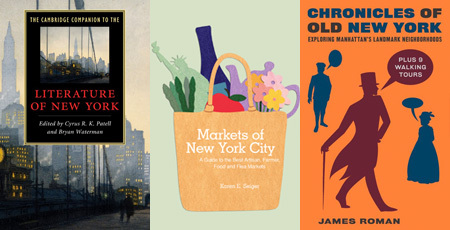 From The Little Bookroom later this month comes Markets of New York City, A Guide to the Best Artisan, Farmer, Food and Flea Markets by Karen Seiger. The book has a snappy design and takes an appealingly comprehensive approach: besides the much-loved Brooklyn Flea and its ilk, you'll also find info on the Greenmarkets, seasonal markets, and classics such as Arthur Avenue. On Thursday, May 20th, Ms. Seiger will be at Posman Books in Chelsea Market (6-8pm) and at Brooklyn Indie Market on Saturday, May 22nd, 11am-5pm. More at the book's blog here. In June, Museyon publishes Chronicles of Old New York: Exploring Manhattan's Landmark Neighborhoods by James Roman, with stories of artists, architects, neighborhoods and buildings, followed by nine walking tours. It's an appealing package, though much of the material may be familiar. And while John Jacob Astor, Cornelius Vanderbilt, and Gertrude Whitney always make for good reading, Donald Trump does not.